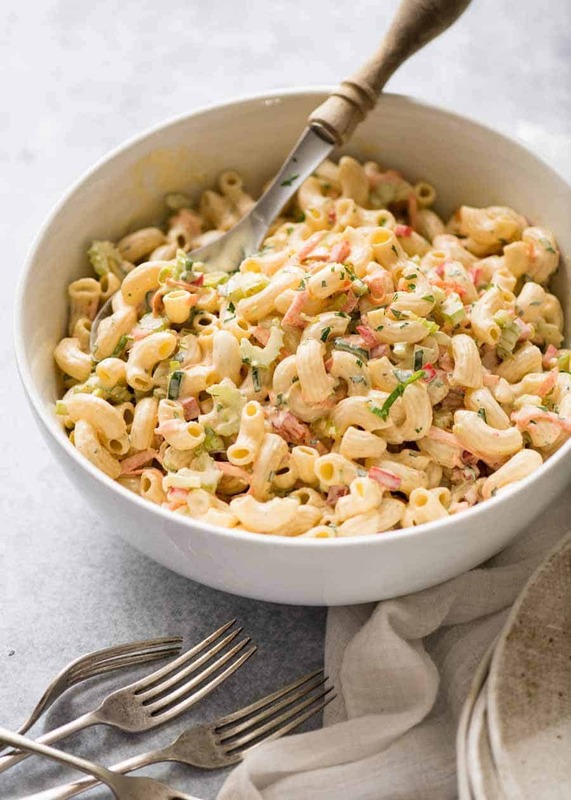 Macaroni Salad makes a terrific summertime lunch and is made for taking to gatherings. Simple to prepare and as diverse as you want it to be, this is a great classic pasta salad. 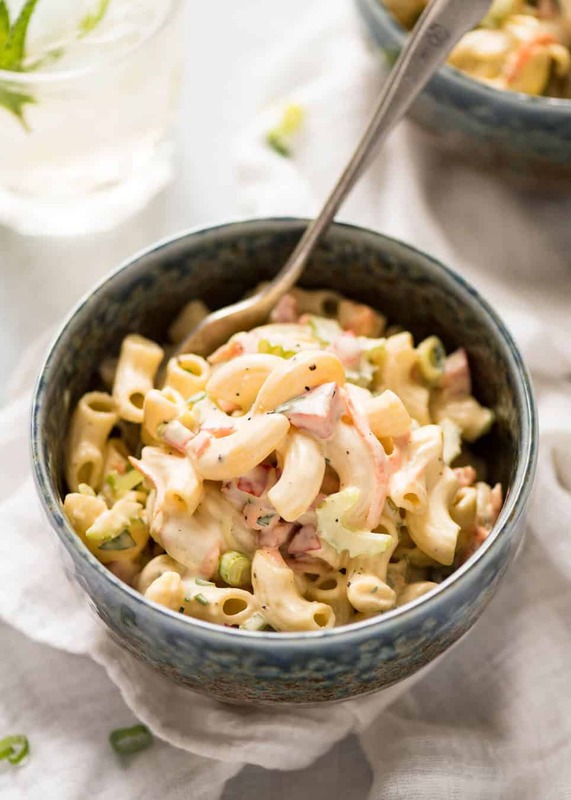 With a pasta salad dressing made with a combination of mayonnaise and yoghurt, it’s still beautifully creamy with all the flavour and less guilt! 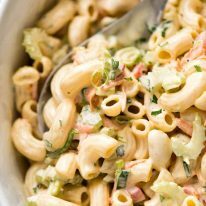 For a healthier option, try this Macaroni pasta salad with a mayo-free Creamy Lemon Dressing or Ranch Dressing! What is Macaroni Salad made of? Cooked macaroni, shredded carrot, green onions, red peppers/capsicum and celery tossed in a dressing made with mayonnaise, vinegar, mustard, sugar and garlic powder. How long can you keep macaroni salad? Up to 5 days in the fridge. Do you serve macaroni salad hot or cold? It’s best served at room temperature or ever so slightly chilled. But not cold, straight out of the fridge. Can you freeze macaroni salad? Yes, because it’s mostly pasta. Thaw naturally (do not microwave thaw) and toss well before serving. It’s difficult to imagine a summer with Macaroni Salad. Like Coleslaw, it’s a summertime staple. 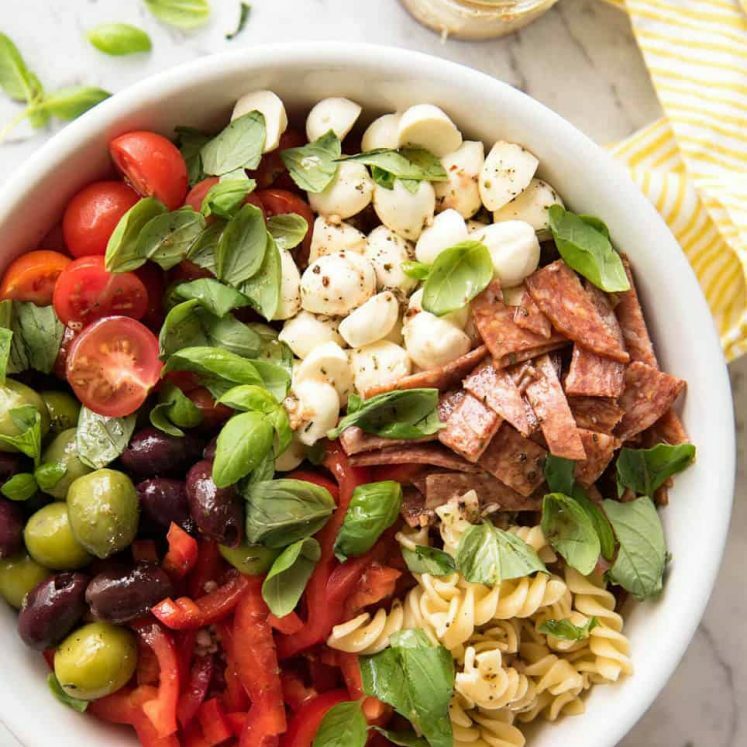 The pasta salad you keep in your fridge for a quick side for meals and to put in your lunchbox. While it’s tempting to take the easy route and pick up a tub from the deli, too often they are overly mayo-heavy, too sweet, too sour, or dripping with watery dressing. So skip store bought and make your own – it’s so simple and tastes so much better! I like to have a lot of dressing because it makes pasta salads moist and juicy. But using just mayo is too oily. So I always lighten up mayo dressings with either sour cream or yoghurt, then add a nice amount of seasoning so no one would even notice that it’s got less fat in it! Cider vinegar – essential touch of tang! Regular readers know how much I love my sauces and that extends to salad dressings. No pasta salad recipe of mine will ever be lacking in Dressing! 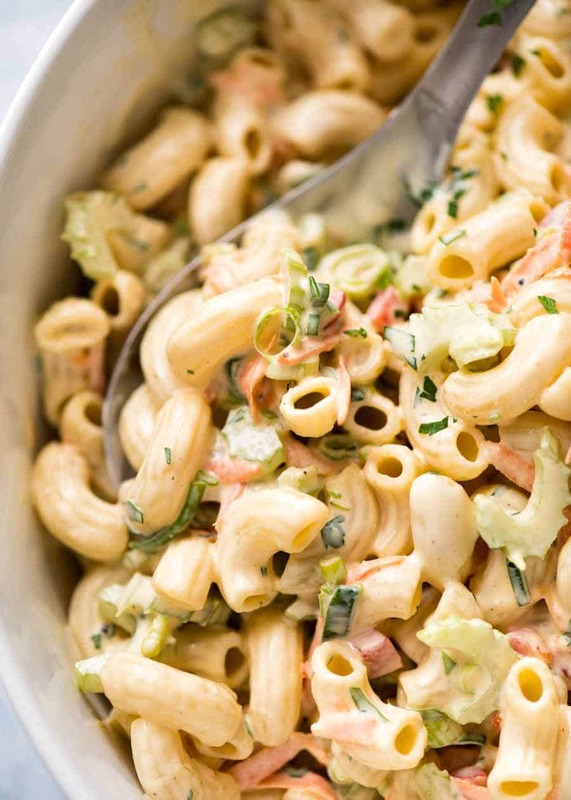 And that’s why this Macaroni Salad stays nice and moist – because there’s plenty of dressing! Wondering if Macaroni Salad is good or bad for you? 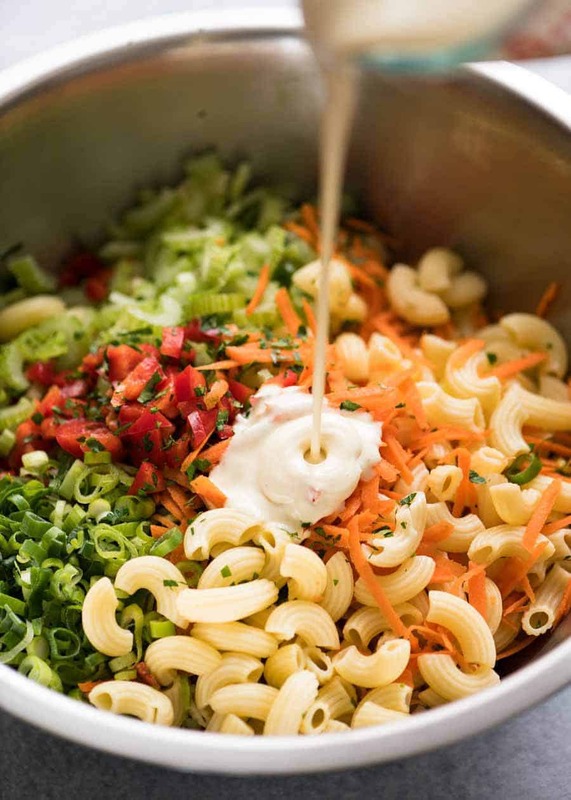 While you get some nutrition from the vegetables the reality is that Macaroni salad is heavy on carbs from the pasta and fat in the dressing. 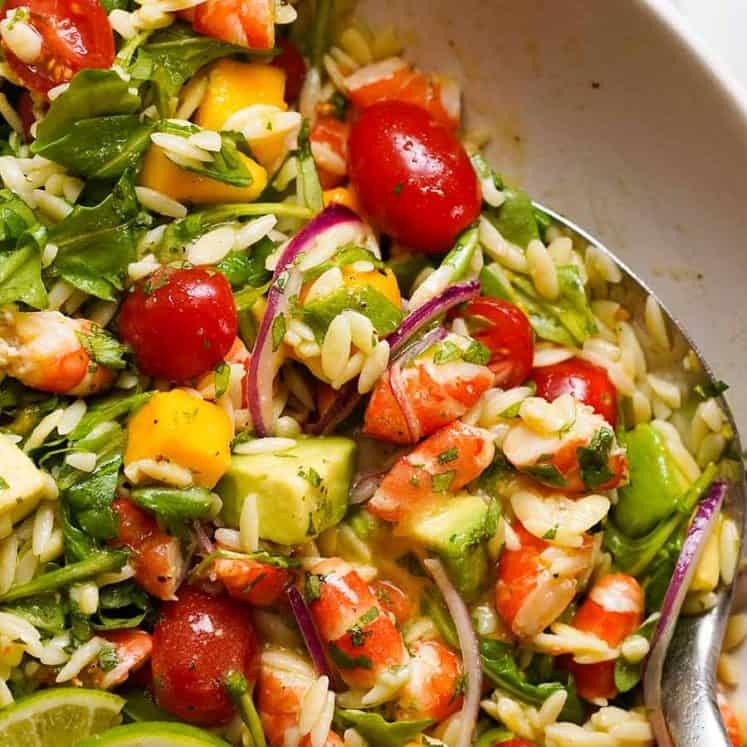 For a healthier option, try this with a mayo-free Creamy Lemon Dressing or Ranch Dressing! Recipe VIDEO above. This is just a great classic, Macaroni Salad. 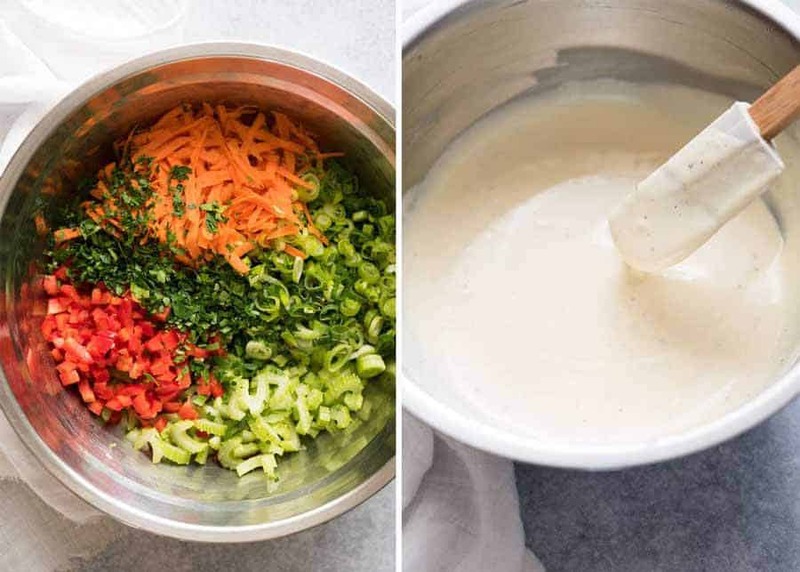 Plenty of creamy dressing that you know and love, but slightly lightened up - all the flavour, less guilt! Serves 6-8 as a side. For an even healthier option, try this with a mayo-free Creamy Lemon Dressing or Ranch Dressing! Bring large pot of water to the boil - 4 to 5 litres / quarts. Add salt then add pasta. Cook per packet directions. Meanwhile, mix Dressing ingredients in a bowl. Place pasta in a bowl. Add remaining Macaroni Salad ingredients. Pour over Dressing. Toss. Adjust salt / sugar / sour (vinegar) / mayo to taste. Set aside for at least 20 minutes. Then serve at room temperature (not cold). It's great the next day too! 1. Lots of add-in potential here. Bacon, ham, egg, grated cheese, chicken, olives, diced chillies - go wild! But if this is for a side dish with other strong flavoured mains, I'd urge you to consider sticking with the a fairly classic version. 🙂 I love KAPOW flavours, but there is such thing as too much in a meal! 2. No-Mayo dressing option - use Lemon Yogurt Salad Dressing (it's really terrific!). Ideal for both Macaroni Salad and Coleslaw. 3. Storage - keeps for up to 5 days in the fridge. Can also be frozen - thaw naturally (do not microwave thaw) and toss well before serving. 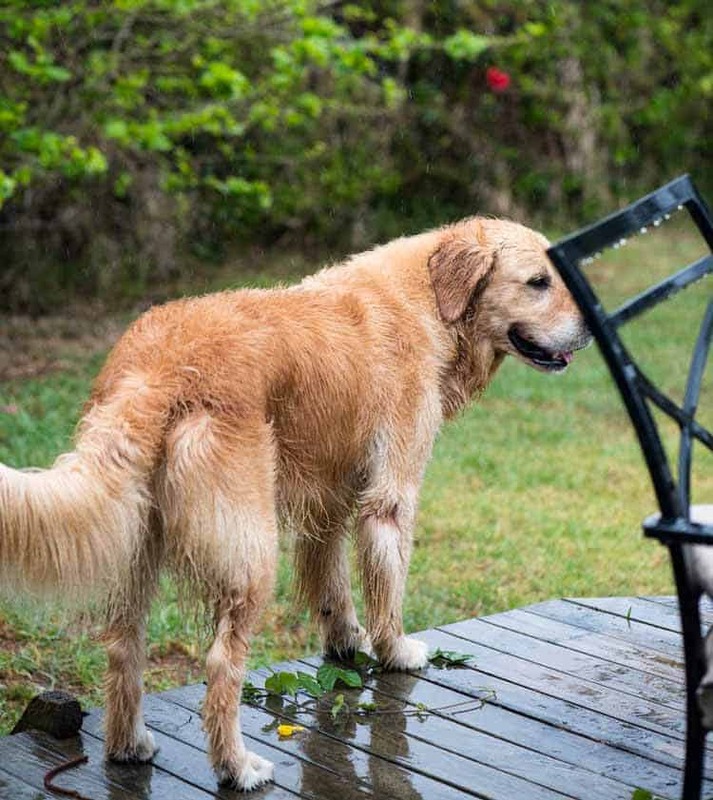 When I leave Dozer indoors when I’m out all day and it’s been raining (damn that dog door!!!!). Made this exactly to recipe except used about a 1/4 of a sweet onion grated cause I didn’t have shallots/green onions. Also made another batch of another recipe that used pickle juice and relish instead of vinegar, plus less dressing. 5 of 7 people including me preferred your recipe over the other recipe. I used German mustard, tomato, and Persian cucumber. turned out great! Nagi, thank you for another five star recipe! I used German mustard in place of Dijon because it is all I had. It turned out great! excellent recipe. This will be a weekly staple this summer. This is a very good site. I live in Winnipeg Canada and it’s mid March and we still have 2 feet of snow on the ground but I’m already planning a bunch of summer menus from your site. Particularly the Arabian Nights feast. Thanks for the inspiration. You’re so welcome Tim, hopefully the warm weather comes soon for you! Absolutely delicious! Thanks Nagi!! Added egg, bacon and chicken!! 😃😃 Great for school lunch… although I had to pick out the capsicum as my boys are not fans!!! Love macaroni salad, never use mayonnaise . . .amazing what one can do with yogurt and other dressings . . . this a lovely version I have just put on tomorrow’s lunch plan . . . 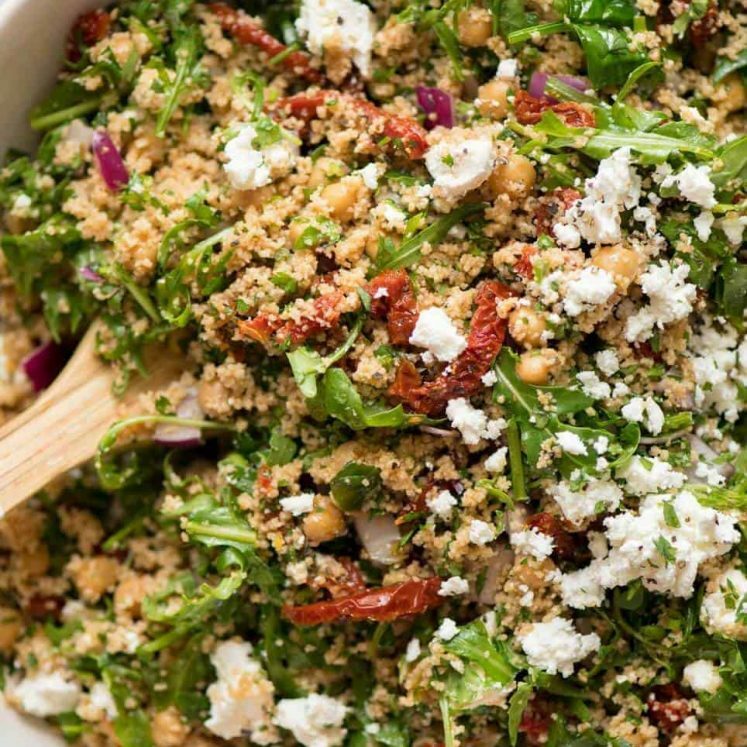 Yes, greek yogurt is amazing in dressings!! I hope you love this one! Thank you,I love love it 😊. PS – AND my dogs love them too – sorry cannot post pictures of my dogs eating broccoli salad!